I am often asked if there is any correlation or relationship between the Mayan Calendar – with its looming date of December 21, 2012 – and the yugas. There are, in fact, several intriguing parallels. First, the Mayan Calendar begins in 3114 BC. The yuga cycle, being a recurring cycle, doesn’t have a beginning date per se, but the four ages (yugas) within the cycle do. The last energy age (descending Dwapara Yuga) began in 3100 BC. These dates are almost the same. If we take into account the need for both systems (Mayan and Yuga) to have been converted to our current Gregorian calendar, the dates may actually have been the same. Such similar dates makes me believe that both systems must draw on some of the same ancient knowledge. Second, as practically everyone knows by now, the Mayan Calendar is believed by many to end on December 21, 2012. The beginning of the transition into our current energy age began in 1700 AD. The transition was completed by 1900 AD, at which time mankind fully entered Dwapara Yuga. There are, however, differences of opinion on the exact date the Mayan Calendar ends. As I mentioned above, it has been necessary to convert from one calendaring system to another in order to have arrived at the 2012 date. Some experts believe the conversion could be calculated in other ways and that the end of the Mayan calendar may already have come and gone. Even if 2012 is the correct date, the end of the Mayan Calendar matches fairly closely the beginning of our current Dwapara Yuga. You might say that 2012 AD and 1700 AD, or even 1900 AD, are not very close, but if you look at it from the perspective of it having been over 5000 years since the start of the Mayan Calendar these dates are very close – especially if, as some experts suggest, the end date of the Mayan Calendar was earlier than 2012. Third, another intriguing correlation between the two systems, discovered by my co-author David Steinmetz, has to do with the precessional cycle. I can’t explain the precessional cycle in full without taking up too much time in this post, but, in a nutshell, the precession is the astronomical effect that results in the astrological ages. For example, if we go by the vernal equinox, we are said to be in the Age of Pisces, soon precessing (moving backwards) into the Age of Aquarius. Modern astronomy tells us that the precessional cycle takes about 26,000 years to complete. Sri Yukteswar, from whom we get the modern version of the yugas, said that the cycle takes about 24,000 years to complete. Some people suggest that the rate of precession may not be constant and that it could speed up in the future, making the complete cycle take less than 26,000 years, or Sri Yukteswar’s “about” 24,000 years could also imply that he knew the cycle is longer than 24,000 years. If we assume that the creators of the Mayan Calendar had knowledge of the precessional cycle, and that they used an approximate length of 26,000 years, then the length of the current Mayan Calendar is almost exactly one fifth of the 26,000 year precessional cycle. The correlation that my co-author David Steinmetz spotted was that from the beginning of descending Dwapara Yuga (3100 BC) to the beginning of ascending Dwapara Yuga (1700 AD) is exactly one fifth of the shorter 24,000 year cycle. Both systems correlate precisely in that they have progressed one fifth of a precessional cycle since approximately 3100 BC. What they don’t correlate on precisely is the length of the precessional cycle. Perhaps they started in synch and then lost clarity over time as mankind went through the dark times of the material ages (Kali Yuga – 700 BC to 1700 AD)? What could all this mean in terms of what 2012 portends? Current predictions of what we can expect in 2012 vary widely from worldwide catastrophe to worldwide illumination. Since the creators of the Mayan Calendar give us little to go on we do not have much to guide our understanding. However if there is, as it appears, a correlation between the Mayan Calendar and the yugas, then we can look to the more complete knowledge we have of the yugas to suggest what 2012 may mean for us. The yugas indicate that we are in an energy age: an age during which mankind can understand that all matter is energy in a different form; and an age in which each of us is becoming more aware of our own inner, subtle energy, or life force. Our Dwapara knowledge of energy has given us great power, yet, early as we are in the unfolding of Dwapara Yuga, it has not yet given us great wisdom. The result is an unstable world seemingly capable of self-destruction, or of creating such high levels of inharmonious vibrations that our physical world may be rent with upheaval and catastrophe. Our growing attunement to inner, subtle energy may, however, save us from such an unhappy fate. At the same time that we see unsettling political and economic trends, we also see a worldwide awakening to man’s higher potentials. Meditation, yoga, tai chi, energy medicine, personal spiritual experience, are but a tiny handful of examples of how a new life force-based understanding is manifesting all over the world. Like minded people are finding each other to help create positive, calming influences to offset the negative. Will it be enough? Will it be soon enough? The yugas tell us emphatically that in the centuries and millennia ahead mankind will rise to heights only dreamed of today. Worldwide illumination is the yuga’s promise for the future. Will we reach that future without destruction? That is really up to us. Each of us has the opportunity to influence how our current age will unfold. Be encouraged. Deliberate and consciously positive acts have a much greater influence than do their opposite. Prayer, affirmation, and living your highest ideals are potent antidotes for the ills of the age – and we have the rising tide of Dwapara awareness working with us to give them power. Energy is the keynote of our current Dwapara age. Since Dwapara Yuga’s transition began in 1700AD, man has been making discovery after discovery regarding energy. In the 1800s the laws o electromagnetism were worked out which led to the worldwide use of electricity as a form of power. With the major exception of transportation, and even that is beginning to change toward electric vehicles, all of our world’s infrastructure is based on electricity. Electricity is the current energy king. Several other forms of power have been discovered and developed, but for the most part they have all been put to use to generate electricity. Nuclear energy was discovered at the beginning of the 1900s and was developed in the 1940s and 50s. Ironically, this new and potent form of energy is used to generate heat, one of the oldest uses of energy. The heat generated by controlled nuclear fission is used, basically, to boil water. The resulting steam is used to spin turbines to generate electricity. Turbine generated electricity has been around since the late 1800s. The only difference between nuclear power plants, and the much older technology of coal, oil, or natural gas power plants, is the source of energy used to create steam. Photovoltaic cells (solar cells) and hydrogen fuel cells are among the first technologies that convert an energy source (the sun’s rays, hydrogen gas) directly into electricity – without first having to convert the energy source to heat. Converting energy to heat is generally a highly-polluting, energy-inefficient, and often perilous process. Discoveries like magnetricity indicate that our world’s current global warming crisis may be solved not only by reducing our use of fossil fuels, through solar or wind energy, but also by reducing our dependence on electricity itself. Will magnetricity be able to supplant electricity the current energy king? The ubiquitous use of electricity in our modern society is hardly going to go away overnight, but magnetricity, or perhaps another new form of energy, may one day supplant it or soon at least complement it. Magnetricity may turn out to be easier or less costly to generate. Perhaps the earth’s magnetic field can be tapped into. Perhaps the 100 million times greater than previously known magnetic effect of light passing through a non-conducting material will allow us to harness solar power far more efficiently than photovoltaics currently do. Perhaps certain uses, such as generating heat for homes, or powering automobiles will prove to be more efficient using magnetricity. In any event, the unfolding of Dwapara Yuga is sure to bring more discoveries about energy – and more uses for energy as well. We are only at the beginning of the energy age. Born in 1706, Benjamin Franklin came into the world just a few years after Dwapara Yuga began in 1700. Franklin’s amazing life gives us a fascinating view of the transition the world went through as the old forms and material view of Kali Yuga fell away and the new consciousness of Dwapara Yuga began to change the world. Even though Franklin was born after the beginning of Dwapara Yuga, in a very real sense Benjamin Franklin’s life began in Kali Yuga. He was born into a rigidly religious family, the fifteenth child of an uneducated tradesman, who was in turn the son of an uneducated tradesman. The only books available to young Franklin were the Puritan religious books of the day and the only prospect for his future was to become a tradesman himself. Rigid religious orthodoxy, no social mobility, and the absence of education are all hallmarks of Kali Yuga. Even as a young man Franklin was appalled by his options and at the age of seventeen Franklin literally ran away from his family to make a fresh start – not just in employment, but in all facets of his life – religious, political, civic, moral, educational and scientific. In the process Franklin embodied and made significant contributions to nearly every shaping trend of Dwapara Yuga. As much as Franklin was a Founding Father of America, I think we can say he was even more significantly a Founding Father of Dwapara Yuga. A hallmark of Dwapara Yuga is energy awareness. Our current age is profoundly shaped by our awareness and use of energy. Franklin was one of the earliest to help usher in that awareness. It is easy to assume, given Franklin’s better known civic activities in Philadelphia and his involvement with the American Revolution as a statesman and diplomat, that his celebrated experiments with electricity – notably flying a kite in an electrical storm – were the gentlemanly dabbling of an enthusiast, re-creations of experiments performed by other more serious scientists in Europe. The opposite is actually the truth. Franklin was at the forefront of discovery and his experiments were the one’s re-created by others. Franklin devoted many years to unlocking the secrets of electricity. It was Franklin who derived one of electricity’s most fundamental laws – that electricity “flows” like a “current” from positively charged objects to negatively charged objects – and all later developments in harnessing electricity obey this law. It is only due to the preponderance of Franklin’s other civic activities and contributions that the importance of his seminal work with electricity has become obscured. In fact, during his lifetime, he was known in Europe primarily as a scientist and referred to as Dr. Franklin in recognition of the many honorary degrees that were bestowed upon him for his scientific accomplishments. If he had done nothing else to overshadow his electrical discoveries, it is likely that he would be thought of as the Father of Electricity instead of a Founding Father of the U.S.
Benjamin Franklin could be the poster child for another hallmark of Dwapara Yuga: the “rapid expansion of knowledge in all departments” as Sri Yukteswar described it. Franklin is considered to have been a polymath, one whose interests and knowledge span a vast number and variety of subjects. Franklin was self taught and an avid reader. Among his civic contributions was the creation of the first lending library – of which he no doubt made good use. 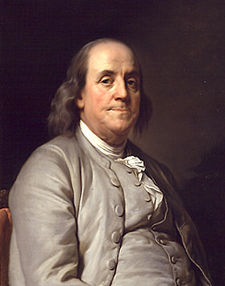 Franklin’s interests and accomplishments included: scientific investigations into electricity, the wave theory of light, meteorology, evaporative cooling, and electrical conductivity; invention of an energy-efficient wood or coal stove (the Franklin Stove); discovery and mapping of the Gulf Stream; invention of bi-focals, the lightening rod, an odometer, and a flexible medical catheter; formation of the first sanitation and volunteer fire departments; foundation of the first hospital and college in Pennsylvania, and development of the first anti-counterfeiting currency. Franklin was a member of the Lunar Society in England (a prestigious scientific society), founded the American Philosophical Society, was an accomplished writer (Poor Richard’s Almanac, Pennsylvania Gazette, Autobiography of Benjamin Franklin, and a vast correspondence covering hundreds of subjects), an original moralist and humanist philosopher, statesman, and diplomat. Franklin played the violin, harp and guitar, composed music, invented a musical instrument called the glass armonica, and was an avid chess player. He was also an innovative man of business and was so successful in establishing (what would now be considered) a chain of printing houses, that he was able to retire from day-to-day management by the age of 42. Franklin went on to invest in real estate and other ventures and in time became one of the richest men in America. By any measure Franklin was an extraordinary man and would be an extraordinary man in any age, but the astonishing breadth of his interests and accomplishments is emblematic of Dwapara Yuga’s stimulating affect on the intellect and awareness. Perhaps the hallmark of Dwapara Yuga which Franklin most embodies is the rise of the individual. During Kali Yuga (700 BC to 1700 AD) the lot of the common man was very poor. The vast majority of people – farmers, herdsmen, soldiers and slaves – were ruled over with absolute power by small ruling elites. Their lives were short and their prospects for education or advancement were non-existent. Rulers considered people as barely more than possessions. Franklin rejected the old Kali Yuga model at the young age of seventeen when he ran away from his family’s religious orthodoxy and the dead end of an apprenticeship in his brother’s printing business, to embrace the unknown possibilities of individual freedom. In an earlier time his choice could have been disastrous. Those who left the security of home and family in Kali Yuga rarely found anything but poverty and squalor. But Franklin entered a world of real possibility in Boston, New York, London and Philadelphia, where an individual could raise his circumstances by employing intelligence and diligence. You could say that Franklin’s was the original “rags to riches” story. Not only did Franklin embody this new spirit of possibility, he became a champion of individualism and humanism. He founded or helped found many guilds and societies which empowered ordinary individuals to “get ahead”. Not only did he found one of the first colleges in America, but he made sure that it was open to anyone of intelligence. His Poor Richard’s Almanac is full of exhortations to inspire the common man to better himself. Franklin’s most enduring contributions to empowering the individual are perhaps the Bill of Rights and the U.S. Constitution. Franklin was not the primary author of either, but he had unsurpassed influence in the Continental Congress where the concepts, tenets and language of these documents were decided upon. In the Bill of Rights, we have the codification of “unalienable” rights for individuals that no king or sovereign or government can take away – stated explicitly and exactly as part of the laws of the land. In the creation of the Judicial Branch of the government on equal footing with the Legislative and the Executive Branches, we have the establishment of the primacy of the rule of law. By so doing, it made it impossible for the President or Congress to take actions or enact laws that were contrary to the established laws of the land. Finally, in the informing spirit of the U.S. Constitution and the birth of democracy, the government was conceived as a servant of the people, overturning millennia of monarchical tradition in which the people were the servants of the government. Father of Electricity, man of ever expanding knowledge and interest, and champion of the individual, Franklin embodied much of the emerging spirit of Dwapara Yuga. It is certainly no stretch to call him a Founding Father of Dwapara Yuga – though no school textbook is likely to call him that any time soon! Can you think of any other candidates for Founding Fathers of Dwapara Yuga? I am very pleased to be able to provide this “guest post” by Swami Kriyananda, a direct disciple of Paramhansa Yogananda. Kriyananda learned about the yugas and many future trends directly from Yogananda. Yogananda was himself a direct disciple of Sri Yukteswar, who wrote the Holy Science in which the yugas are described. We are now over a century into an ascending Dwapara Yuga: the age of energy. Already, the word energy is heard everywhere. Today we face the growing probability of a great economic crises. My Guru, Paramhansa Yogananda, said it would be “much worse than the depression of the 1930s.” He added, “Money won’t be worth the paper it is printed on.” These troubles may be attributed to mankind’s need to adjust to new ways of looking at life and at objective reality. Already the true jobless figures are much higher than the official figures, which do not take into account all those, for example, whose unemployment compensation has run out, or those (for another) who have had to take relatively low-pay jobs after living in luxury on very high incomes. The best way to weather this crisis will be to start thinking in Dwapara Yuga ways. Think energy. Think energetically. Think of those things which will help to generate energy in new ways: sun, wind, tides spring instantly to mind. Land used to be the basis of wealth. Today it is energy. One can make a fortune in his own basement; he doesn’t need land to make him rich. Computers have made it possible for people to live far from the cities. Indeed, they have made it easier to do so. One can be in touch with a world-wide clientele. Mahatma Gandhi called the cities of modern times “a disease.” I believe they will in time become a thing of the past. I believe people will live in small communities, rather than in large cities. I have already proved that this is possible, by founding eight communities on three continents — places where a total of about 1,000 people live and support themselves. They do so in a most unusually happy and harmonious environment. Being people of high ideals, who share the same ideals, has made possible an environment altogether different from that which one finds in the cities, where people in the same apartment building do not even know one another. Do they think in terms of energy? Yes, certainly. But I must add that there are many different kinds of energy. An atmosphere of kindness is a kind of energy. So is an atmosphere of mutual support and cooperation. So also is the understanding that high ideals are essential for a happy life, and that that happiness is greatly increased when all one’s associates share the same basic ideals.